After months of rampant speculation (and an abnormally high number of apparent leaks), the new iPhone has arrived. 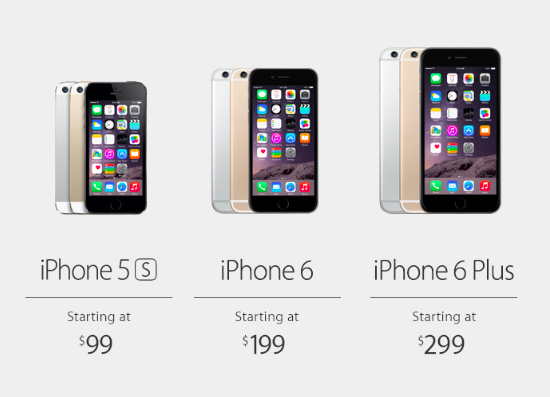 In fact, two new iPhones have arrived — the iPhone 6, and the iPhone 6 Plus. Apple is right in the middle of announcing the new device as we speak, in an auditorium filled with everyone from Stephen Fry and Dr. Oz to mega stars like our own live bloggers Darrell Etherington and Matthew Panzarino. Curiously, the announcement is being held in Cupertino’s Flint Center. It’s a venue that Apple hasn’t used for an announcement in over 15 years, but it’s the very same place where Apple debuted both the original Mac in 1984 and the first iMac in 1998. This news is breaking at the very second we’re writing this post, so refresh the page for updates as they roll in. Both phones feature “Retina HD” displays; the iPhone 6 comes in at 4.7 inches (at 1334×750), while the iPhone 6 Plus comes in at 5.5 inches (at 1920×1080). Apple says these are “the thinnest phones [they’ve] ever made”, at 6.9mm and 7.1mm, respectively. Both handsets are powered by Apple’s new A8 processor, which Apple claims is at least 25% faster than the A7 by processing power, and 50% faster by graphic rendering prowess. Apple is claiming drastically improved battery life across the board; we grabbed a screenshot of the table comparing the battery life across different situations on the 5S, 6, and 6 Plus — see it here. Both phones now have “phase detection” auto focus similar to what most SLR cameras use, allowing for much faster photo focusing. The age-old rumor that Apple would adopt NFC has finally come true! Both handsets will have NFC built-in for mobile payments. Apple has announced that McDonald’s, Whole Foods, Disney, Panera, Sephora (and of course Apple themselves) will support one-touch payments from the device, though “Apple Pay” won’t launch until sometime in October. Pre-orders will start September 12th, with availability on September 19th.